Pick the Right Part! is a minigame found in Mario & Sonic at the Olympic Winter Games. To access it, the players must have Tails in their team. In Frostown, there is a broken mechanism that controls a gate. Tails has to fix it to open the gate. However, he doesn't know how it works and can only fix it if he sees a similar one working. Another mechanism can be found in Polastraits and if Tails checks it out, the players have to return to the broken one to fix it. 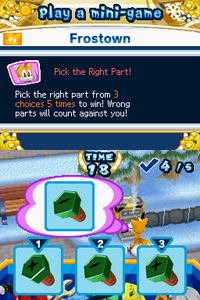 To win the game, the player has to pick the item Tails wants. To do so, they must choose from three items under Tails' speech bubble. The item has to be identical to the one in the speech bubble. After doing this five time correctly, the minigame is won. Pick the right part from 3 choices 5 times to win! Wrong parts will count against you! This page was last edited on March 9, 2018, at 22:00.